Social developments in late 19th-century Europe and changes in that continent's cultural an economic life led to transformed conditions in the musical life of the lower social classes. The democratization of petit bourgeoisie and proletarian cultural life and the aspiration of those classes for their own forms of culture had numerous consequences that greatly affected musical life. Objects of bourgeois education, until then only available to the upper classes, penetrated increasingly into the culture of the general folk and were partially assimilated. General education in the schools as well as educational associations for adults experienced an upswing that had been unknown until then. In this climate, the transmitted forms of customary music-making had to undergo change. These changes were produced from the concurrence of numerous factors, of which two will serve here as a point of departure for our description of a new development in musical instrument construction and use: 1. the industrially manufacture of musical instruments and 2. the concept – or construct – of "folk music instrument" at the beginning of the 20th century in central Europe. Both aspects, the economic and the ideological, form in their mutual dependence the basis for the emergence of a new form of music-making practice and of a specific understanding of folk music that changed earlier conceptualizations. The general rise of large-scale industrial production during the second half of the 19th century also extended to the manufacture of musical instruments. This mass production of instruments, which already had taken place since the 18th century in factories particularly in England, at first fulfilled the same functions as traditional musical instrument construction. The functional cycle represented in fig. 1 reflects the whole system of musical instrument development (Heyde 1979, 49f. ; Michel 1990, 4-9). 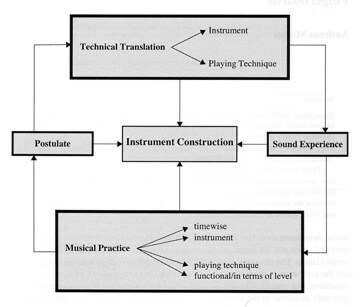 In this, musical instrument construction is a mediator between the determinants of the whole system, which include the elements: musical praxis, "postulate" (meaning all expectations and demands related to sound and playing technique), technical realization of the postulate and sound reality. These elements form a circulatory cycle, in which musical instrument construction acts as producer and in a mediating way. 3. ensuring continuing new sales through innovations. These three aspects of capitalistic industrial production marked the development of musical instruments at the end of the 19th century in an essential way. A particular group of "newly discovered" chordophones can be understood, more than any other type of instrument of this period, as a part and result of this process: zithers without fingerboards. During a period of approximately fifty years – until around the 1940s – zithers without fingerboards were a significant phenomenon in industrially construction and represent an exemplary model case. The modern European zither, which developed from the Scheitholt zither and adopted characteristics of the cittern and the guitar, is generally a fingerboard zither. As such, by the mid-19th century it had reached a certain level of musical-historical significance and integration in contemporary central European musical life. The development of the zither without fingerboard, which is related to the late-medieval psaltery, constitutes both morphologically as well as music-culturally an independent development. As is revealed in sales figures, the musical instrument industry served mass interests with innumerable inventions, new developments and in some cases with experiments that had not been thoroughly thought out. Many curiosities were offered with great fanfare. 2. 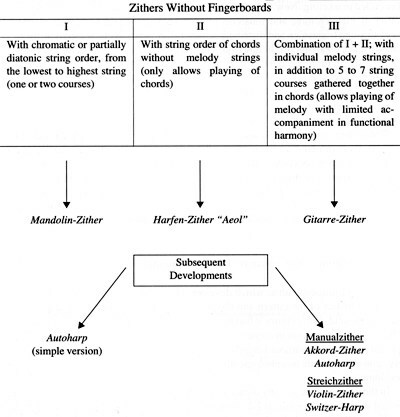 Zithers without fingerboards having the string order of chords; on these instruments, five to eight strings are gathered in each course, which are tuned to sound in three voices. Several three-voiced chords enable one to play simple chord progressions in functional harmony, being originally so tuned. The instrument is not meant for playing melodies (see Inv.-No. 4151). 3. Combination of 1) and 2); thus, an instrument with individual melodic strings covering two or three octaves, within which five to seven strings are gathered together into groups arranged in chords. This instrument provides simultaneous, limited accompaniment in functional harmony to the playing of melodies. The names given to these models – often these are good-sounding labels for advertising purposes – sometimes seem confusing and misleading. Most of the names can be traced to the roots of Harfen-Zither and Gitarre(n)-Zither. Additional variants are: Mandolin-Gitarr-Zither and Mandolinen-Harfen-Zither (for instruments with double-course strings), Konzert-Gitarren-Zither, Salonharfe, Sonora-Zither (an advertising name), etc. The names were not invented in any logical way but rather were expected to create sound associations which could, however, hardly be realized in reality. From a systematic point of view, the closest designation of Akkordzither (chord zither) as a generic term should also be avoided, for it is applied to zithers, without fingerboards but having key manuals. Signature: "Menzenhauers Guitar-Zither / 3½ ORIGINAL 3½ / Menzenhauer & Schmidt. Berlin"
Signature: "F. MENZENHAUER'S / GUITAR-ZITHER / No. 2½ / D.G.M.P. No. 168.664 / Fabricirt von / MENZENHAUER & SCHMIDT / BERLIN - NEW YORK"
Signatures (engraving on the cover surface of the manual box): "Thierfeld's / Accordzither" and "Mignon" (celluloid label on the side facing the back of the manual box); ; "D.R.G.M. 70378"
Zither instruments without fretboard were designated Gitarrenzither (see fig. 3, 6, 9-11) and were played in the traditional way for a zither, with fingers and a thumb plectrum. In terms of construction, these zithers have little in common with the guitar; the designation refers more to the sound it produced, which is typical of chord playing on the guitar. In addition to the melody strings, which usually cover three octaves and are chromatically tuned (c' – c'''), there are 24 to 30 accompanying strings gathered together in five or six chords (e.g. e-minor – A-major – D-major – F-major – G-major – C-major). In 1894 a Gitarr-Zither was patented by Friedrich Menzenhauer of Berlin which was manufactured by the company Oscar Schmidt ("Menzenhauer & Schmidt") in Berlin but also increasingly in New Jersey (U.S.A.). The Harfen-Zithern (fig. 11), distributed also by a German-American concern, reduced musical demands to an even lower degree. This zither instrument, distributed by the German representative of the Aeolian Company of New York, Alwin Eichler in Berlin, dispensed entirely with melody strings and was made purely as an accompanying instrument, with five or six chords (D.R.P. 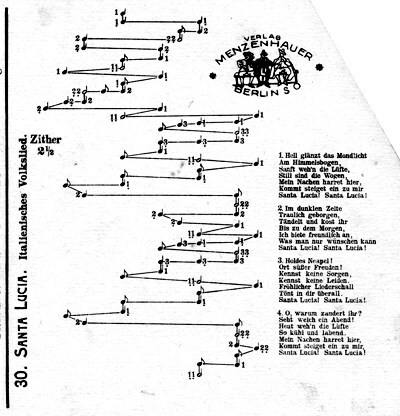 101661 of 3 September 1897: Alwin Eichler zither string order in chordal groups; cf. Wackernagel 1997, 148). In spite of the vehement and understandable rejection of these instruments by traditional zither players, the guitar zithers enjoyed wide distribution. In addition, they were subjected to numerous modifications and "improvements", such as their development to a Mandolin-Gitarr-Zither through the doubling of melody strings, according to the mandolin model. Max Kleiber of Markneukirchen patented in 1900 a lyre zither, a "guitar zither with two harp buttons joined by columns" (D.R.G.M. 130447 of 27 February 1900; cf. Heyde 1989, 15). The name derives from the form, which was supposedly reminiscent of the lyre. 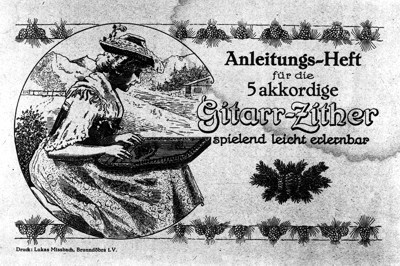 Until the late 1930s, trade and catalogue companies in Markneukirchen and Klingenthal (both cities in the present-day German state of Sachsen) offered a wide palette of such guitar zithers. The instruments were manufactured in great numbers. The design of the instruments was carried out in an empirical way, not simply on a theoretical basis. As a rule, the body was stained and lacquered black, as well as decorated with richly coloured transfer illustrations or with ornamentation in coloured ink. The autoharp (see fig. 5) – in its original form a zither without fingerboard having a "Manualaufsatz" (manual box) or a "Abgreifeinrichtung" (damper bass controlled by keys) – was patented in 1882 in the United States. It is considered an invention of Carl Friedrich Zimmermann, who had immigrated from Germany in 1864. In Germany such instruments were built by Theodor Meinhold in Klingenthal, Paul Thierfeld in Johanngeorgenstadt and the Müller Company, among others (cf. D.R.G.M. 70378 and 80599). The instruments that became widespread during the 20th century under the names Violin-Zither and Violin-Harfe can also be considered special forms of fingerboardless zither. In 1925 the Clemens Neuber Company of Klingenthal received a designation of "Gebrauchsmusterschutz" ("German Registered Design") for a newly developed so called violin zither (D.R.G.M. No. 903152). A violin zither with the name "Kalliope" from the trading firm C. A. Wunderlich, Siebenbrunn (Vogtland, central Germany) carried the D.R.G.M. No. 973507. The instruments combine characteristics of the guitar zither without fingerboard, but also with the possibility of stroking individual strings. A short violin bow, only about 55 cm in length and used with the right hand, is used to play the melody strings. The (usually) 18 diatonically tuned strings used for playing the melody are of different length, so that each can also be played individually at a particular place in the music. The strings for accompanying the melody are arranged in five or six chords, thus allowing simple song accompaniment in functional harmony. The Konzert-Violin-Harfe is a variant of the violin zither built by Max Lausmann of Klingenthal (Reinbothe 1987, 7). At first glance, zithers without fingerboards seem to offer an important advantage in playing technique: the plucking of strings and the tedious process of learning the stopping technique for the left hand are no longer necessary. However, viewed in terms of its historical development, the dispensing of a fingerboard with frets and the expansion of the number of strings (one note per string) together represent in reality a step backwards. For in the history of chordophones it is particularly the reduction of playing strings and the possibility of shortening strings by pressing them down on a fretboard that must be evaluated as a thrust forward in development and as offering more quality to technical playing, as well as musical, possibilities. The zither without fingerboard, on the other hand, represents a step in the other direction. The apparent advantage of dispensing with stopping techniques must be compensated by the more difficult mastery of striking a much larger number of strings. "Zither with score sheets arranged under the strings. Theo. Meinhold in Klingenthal, Sachsen – No. 63702 from 13 October 1891. (Addition to Patent No. 60200 of 30 April 1891.) The score sheet is pushed between two ridges under the strings and is provided with written notes which are so arranged that, when the score sheet is placed in the correct location, it lies under the appropriate strings in order as they are to be played in the notation." The principle of notation is identical: the progression of the melody is represented as a curve that shows, at places marked by notes, where the strings are to be pressed. The accompanying chords are marked with numbers that appear next to each notehead. 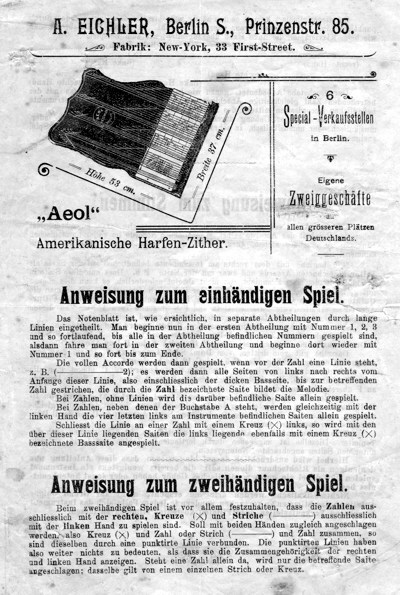 The playing instructions for the American harp-zither "Aeol" made by the Alwin Eichler Company of Berlin are underlaid by a somewhat different system (fig. 11). In this system, the chords to be strummed are marked by crosses (X) and lines (-). All in all, these notational process thus contain information on melodic progression (to the order of notes), the string to be stroked, the length of pitches as well as the three different ways of setting the strings in motion in the chordal accompaniment. When one also considers that these notations lie underneath the strings, it becomes quit clear that "sheet playing" is for all practical purposes excluded. The use of "underlying sheets" demands a longer period of practice and should be understood more as a learning aid. In addition, for the majority of players the multi-layered working out of the notation only becomes accessible when they already know the musical piece. From the existing "underlying sheets" we can see that they went back, almost without exception, to popular songs widespread among the common people. Purely instrumental pieces, such as for example "Menzenhausers Guitar-Zither Mazurka" could be seen as the exception (recorded in the CD Der Zitherhändler, performed by Lorenz Mühlemann, Paolo Imola and Fabian Müller, Mülirad CD/MC 4001, Zürich 1993). In order to promote learning of the guitar-zither, courses were organized and classes formed. Often the recommendation to visit such a course of instruction was made immediately at the time of sale (see for example the contract for courses of the Berne music teacher Leo Prêtre from the year 1933, reproduced in Mühlemann 1993, 14). In 1904 the Zeitschrift für Instrumentenbau informed in a report "On the Situation of the Musical Instrument Industry in Berlin in the Year 1903" that "the instruments with scores that can be laid underneath the strings, introduced already since a number of years and also manufactured now in Berlin, still enjoy a good level of acceptance, particularly the so-called guitar-zither" (ZfI XXIV, 1904, 519). This sales success must have been above all the result of a well-aimed and energetic sales strategy and advertising campaign. How was the sale of the guitar-zither advertised? 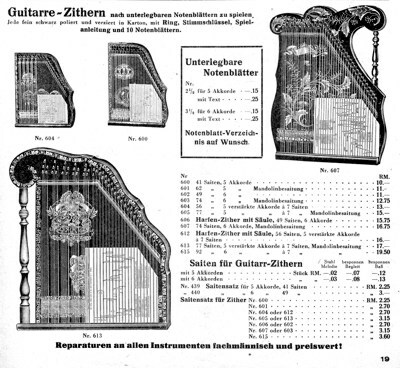 The most important and repeatedly raised argument for the zither without finderboard was the promise to be able to play a musical instrument without instruction or practice: "Without any kind of knowledge of notation, you will definitely be able to play the most beautiful songs, marches and dances within one hour" (see sales catalogue no. XXXV of the trading firm Meinel & Herold, Klingenthal around 1938, p. 67). The blatantly misleading time period that is repeatedly asserted ("within on hour") must certainly have been a mistaken estimate of large proportions and one with frequently disastrous consequences for the disappointed buyer. As already mentioned, it is indeed possible that the notational principle of underlying sheets can be quickly understood, but on the other hand the effort needed to acquire plying skill does not differ greatly (or is only slightly less) than the effort needed on other kinds of instruments. Ideological reasons were given for the distribution of the guitar-zither: according to manufactures and dealers, the instrument, seemingly so simple to play, fulfilled demands for a folk instrument. The concept "Volk" attempts to define the social boundaries, and the concept "Volksmusik" is thereby suggested. Both were to ensure an identify for the instrument. In the sales catalogue no. XXXV of Meinel & Herold, around 1938, we can read (see fig. 6): "The guitar-zither is, rightly so, the folk zither of the future and should not be lacking in any household! Thousands of different kinds of sheet music have appeared and all new publications in the area of music are transferred to underlying music sheets. You can always have the latest hits for guitar-zither". Mass production was to lead to a cultural identity. The capitalistic marketing principle had completely taken over the musical instrument industry. It was not demand that created the product, but rather demand for the product had to be won. - The Sonora Zither has available to it, because of its specials acoustic manner of construction, a wonderful fullness of tone. 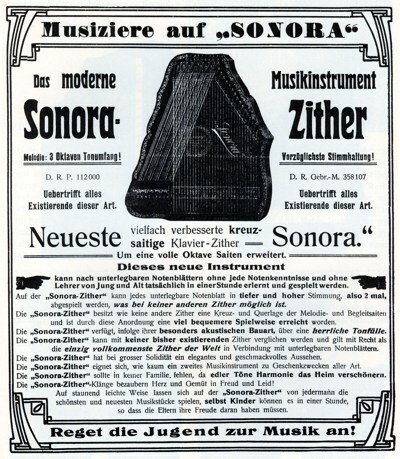 - The Sonora Zither cannot be compared with another other zither existing up to now and is considered, rightly so, the only perfect zither in the world in connection with underlying sheet music. - The Sonora Zither has, with its great solidity, an elegant and tasteful appearance. - The Sonora Zither is appropriate as scarcely any other musical instrument for the purposes of gift-giving of all kinds. - The sounds of the Sonora Zither entrance heart and soul in joy and sorrow! This massive advertising was complemented by the outer design of the instrument which, with highly polished lacquer and bright transfer illustrations, gave the appearance of being of high value. In this way – and the reference to "gift-giving of all kinds" underlines this particularly – the instrument is made into an object of extra-musical significance. Aesthetic appearance determines the cultural value. Mass production also made possible a low sales price. From the beginning the manufacture of guitar-zithers ignored the carefulness and criteria of quality of classical zither construction. A glance at the sales prices listed in the catalogues makes this clear. The sales catalogue no. 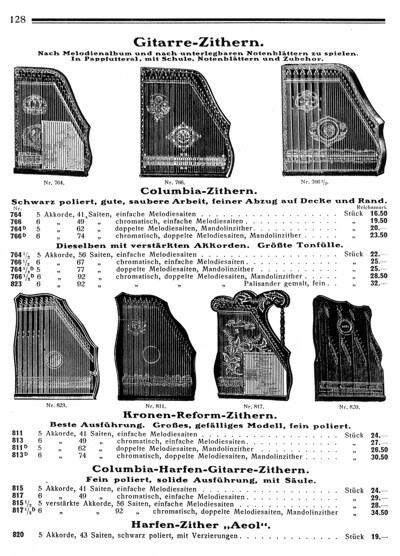 70. of the trading firm Gebrüder Schuster in Markneukirchen (around 1925, p. 120-129) displays ten models of traditional fingerboard zithers (concert zither, "Perfektazithern", "Luftresonanzzithern", etc.) in altogether 26 variations and seven models of fingerboardless zithers (guitar-zithers, chord-zithers, harp-zithers, etc.) The following overview statistics reflect the lowest and highest prices respectively, as well as the average sales price. Even when one considers that fingerboards and geared tuning mechanism for the fingerboard strings raise the manufacturing costs of concert zithers, the price gap between the two groups of instruments – the classical zither models are on the average 5 1/2 times more expensive – is quite conspicuous. The most expensive guitar zither – a so called "Columbia harp-guitar-zither" with 92 strings, double-coursed melody strings and six chords – cost 34.50 Reichsmarks, and thus only a bit more than cheapest concert zither. Through massive advertising, cheap production costs and low sales prices, enormous sales resulted for the zithers without fingerboard. Sales during the height of their popularity can be estimated worldwide at about 500,000 instruments per year. The mass production of the newly developed fingerboardless zithers began in the 1890s and reached its height, according to manufacturers' statistics, around the turn of the century. From then production increased steadily but inconsiderably, with only a slight decline during the First World War. During the 1920s and 30s, the instruments belonged to the standard offering of all musical instrument stores, and because of their low price, many instruments continued to be sold. The Second World War triggered a collapse of the musical instrument industry due to the elimination of the export market, causing sales to fall drastically. The new begin in musical life after the war signified at the same time a remembering of the original folk music instruments (fingerboard zithers), and since the 1950s the guitar has asserted itself as the dominant instrument. Considering the millions of sales of this type of musical instrument, the conclusion that we may speak here of a "popular instrument" seems justified. The level of recognition of zithers without fingerboard continues to this day; for many amateurs, it is still the superlative representative of zithers. Those who, as employees of a musical instrument museum, are involved with sales offerings from the public will quickly experience this firsthand. 1. The didactic value of the instrument consists of annotation form, in principle uncomplicated and self-learnable, and that form's realization. The "underlying sheets" seem to be in fact useful: the autodidact can learn the progression of a known melody. (What is not accomplished is the short period of learning promised in the advertising materials. What can be understood within one hour is the principle that manual dexterity must be learned.) It thus remains open whether mass sales of the instrument led also to equivalent music-making. The thesis that there is no substitute for the transmitted learning of a musical instrument – regardless of folk or art music – is strengthened. In the West, the idea of a universal chordophone that can be learned quickly and without effort remains fiction. Only the chord zither fulfils the promise of a quick-to-learn musical instrument. This instrument attained a certain importance in the pedagogical field, particularly in the United States, as a simple instrument for song accompaniment. 2. In contrast to the enormous sales, a very humble degree of success in musical practice emerged. At any rate, the instruments disappeared at the latest in the 1940s from sales offerings. In the long run, they could not offer any real competition to the traditional fingerboard zither (or other musical instruments. for that matter). The players of fingerboard zithers actually disdain the instrument without fingerboard. The pejorative evaluation of Josef Brandlmeier in the Handbuch der Zither is symptomatic of this attitude: "We frequently encounter further, above all in northern Germany, still another zither with the mark 'Akkordzither' or also 'Gitarren-Zither'; by this is meant however a musical instrument which is not be taken seriously but which is a musical toy, not completely without spirit (psalter type). Included here is also the so called 'Violinzither', a meaningless expression for an instrument, which is praised as a 'substitute' for the violin and which can be played as the types mentioned above with underlying score rolls" (Brandlmeier 1963, 297). Guitar- and chord-zithers no longer play a role in concert life or in other forms of public musical performance in Germany. 3. A specific and individual repertoire that corresponds to the idiom of the instrument was never created. Transcription was the common means of repertoire formation. As in other new developments of logically thought-out instruments, such as the Stössel-Laute, the conception hindered to a large degree virtuosic playing technique. 4. Still, the invention of the zithers without fingerboards also had positive consequences for the broad musical culture in the 20th century. The sound of the instrument has entered, to a limited degree, the corpus of folk and popular music in the largest sense. As a result of nostalgia and intentions of revival, a small group of specialists has emerged which uses these instruments and occasionally develops an individual playing technique on them (see Lieser 1985, 31f. ; Mühlemann 1993, 34f. ).